New York State Standards for Arts, Physical Education, ICT, Drama, and other electives. (1) Next Generation School strives to support an inclusive education for SEN students whenever possible. (2) As part of the registration process any educational, social-emotional, physical, sensory, or medical needs must be fully disclosed in detail during the admission application process. (3) Next Generation School conducts pre-admission assessments for all students to determine their academic level and any special educational needs they may have. (4) "Should the NGS Administration, staff, SEN Department, or Educational Psychologists, or experts affiliated with the school determine that a child has special educational needs, the School reserves the right to ask parents/guardians to provide all the support the school deems necessary to facilitate a positive learning experience for the child at NGS." (5) The school does not specialize in dealing with specific Special Needs, including dyslexia, dyspraxia, Aspergers Syndrome, but "we will do our best to work with parents to provide the support needed for all students." (1) The school is coeducational from FS1 to Grade 3 when students are separated by gender. 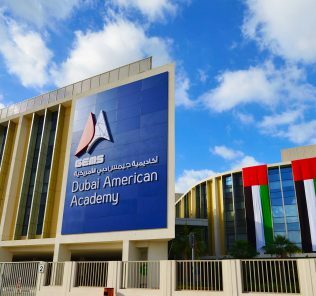 Potentially a beacon for Islamic faith schooling, and the seamless blending of academic, language and cultural curricular, in the Emirates. One to watch. Recommended. 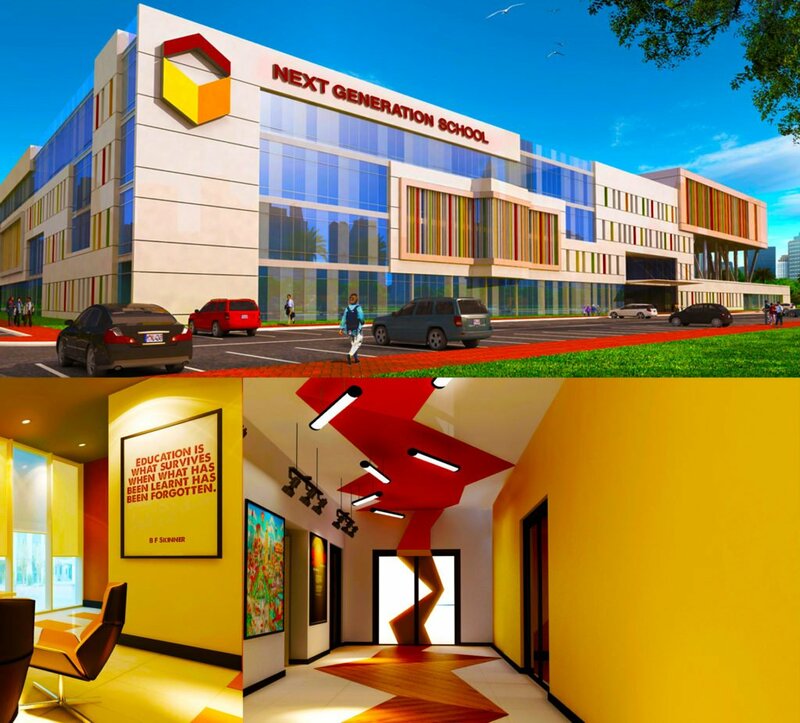 Next Generation School (NGS) Is an Islamic American faith school offering all-through education to students between 4 and 18 years based on a US curriculum underpinned by a significant depth of Islamic study and understanding. The Next Generation US curriculum follows the California State structure, with both Common Core and Next Generation Science standards governing teaching of literacy, numeracy and Science. Prospective parents may want to read our guidance on American Curriculum schools here. Critically, the school is seeking full accreditation from the New England Association of Schools and Colleges (NEASC) as well as membership of the Council of International Schools (CIS). We have written to the school for clarification on Advanced Placement (AP) provision. Updates to follow. NGS has opened in phased launch of all-through provision. 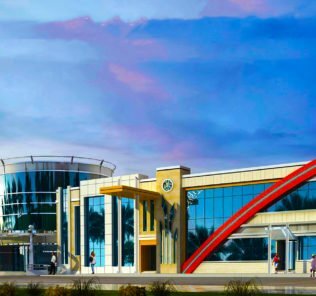 KG1 – Grade 7 and Grades 8-9 will open in September 2020. Remaining all-through provision to Grade 12 will open automatically as students move through the school in September 2021. Children drawn from more than 40 nationalities have currently enrolled at the school. From Grade 4 the classes are segregated between boys and girls. The school seeks differentiates itself by (fabulously) weaving the threads of Islamic study and the Arabic language very deeply within core Academic and American curricular provision. Next Generation is seeking to achieve a very ambitious resolution to the complex challenges of to how to properly integrate cultural identity, a genuine depth of appreciation of Islamic culture and teaching within a traditional American curriculum. Too often in schools, Islamic and Academic education are each run independently, with all the complexities and potential dilution of both that follow. This is a school seeking a genuine bringing together of “East meets West” in a shared home. There are of course some decisions that have to made on one side or other of the balance. They are not always easy. A good example here is the decision not to teach music. Music is an issue that divides Muslim parents in all parts of the world. Some schools do include music with drums for example, as one solution. 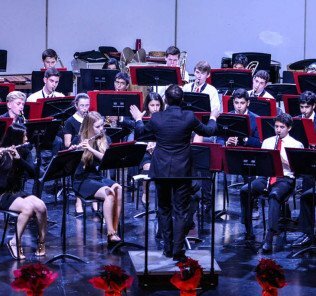 Given the sensitivities we think on balance that the decision is a good one – the school wants to begin its operations with a shared purpose and consensus with parents. This said, for parents seeking at least some concentration on the performing arts, and this includes drama, there will be more suitable schools. This is certainly likely to be the case for gifted children in this area. Prospective parents should also note that all faculty are female. On the note of parental engagement, we particularly like the school’s establishing, at the outset, the ability of parents to pay fees in four instalments. This is a kind recognition that school fees, for many parents, represent a struggle. It is this sort of provision that establishes beyond marketing “fluff” a school serious on its ambition to engage parents deeply within the school’s management, ethos and development. Fees themselves, given the level and quality of Tier facility provision and faculty offer exceptional value. This is certainly the case if fees increase in line with the current published costs for KG – Grade 5 provision. These run from 26,500 AED in KG1 To 38,500 AED in Year 7. Based on a projected increase in yearly fees by 1000 AED per Grade, final Grade 12 fees will reach 43,500 AED. 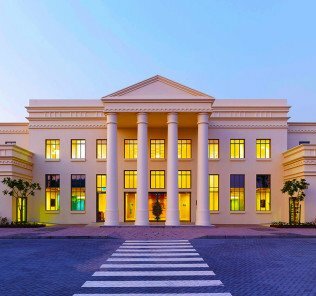 This places the school at the lower end of mid-tier fees in Dubai – and for a premium Tier 1 with this ambition this is, in our view, some achievement. To achieve this, however, without compromising its ambition for delivering a Tier 1 education, the school has had to go for scale. This will be a large school by any standards. 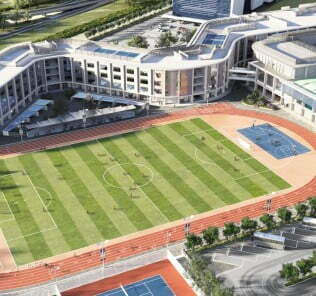 Eventual capacity will lie between 2,200 and 2,900 pupils. Facilities are premium, including four dedicated prayer rooms/halls; covered volleyball/basketball courts; two 25M semi-Olympic heated swimming pools; soccer field; fully digital campus, virtual and augmented virtual reality systems including 3D displays; a botanical garden; 14 science and technology labs by individual specialism; shaded playgrounds and meeting spaces; landscaped 7.5 acre campus; four libraries; Art Room; separate boys and girls sections between Grade 4 and 12, designed ground-up to meet the individual needs of children; LEGO Robotics; Language Labs; tennis courts; touchscreen flooring; Martial Arts room and tablet banks. Currently, as the school phases its opening to all-through, there are 2 clinics, one for KG on the ground floor and one for Primary on the 1st Floor, 2 Libraries and 2 Computer suites. There are Boys and Girls prayer rooms on the 1st floor, each large enough to hold a class at a time. The corridors throughout the school are wide and act as additional/extended learning areas both by means of displays and study spaces for small groups. 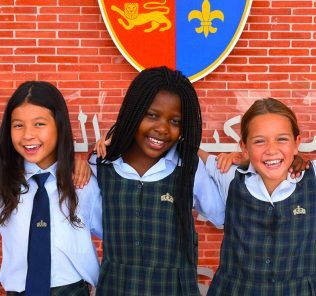 On our first visit (January 2017), it is clear that the Arabic grounding of the school has been incredibly successful. This is true in even small details, for example, unlike the Tier 1 Western schools, NGS has not invested in a social hub for parents within its Reception area/entrance. In many ways, it is actually quite stark compared with the rest of the school. Whilst this in some ways does reflect well the Arabic cultural approach to schooling, and although coffee is available, we think that the benefits of having a reception area that integrates a café are not just skin deep – it is about providing a warm natural area for parents and the school to build community, shared values and a sense of a mutual journey and shared investment. 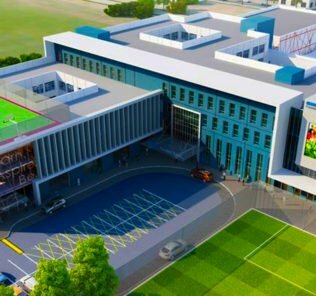 We believe that this building of community and welcome is equally important to all schools and we would hope that the Reception area could make some compromises to bridge this as the school develops over coming years. We noted, for example, in our visit that teachers were less forthcoming and we think that this is because the school design does not lend itself easily to the shared community feel that comes with clearly defined open communal areas designed ground-up to encourage openness and exchange of ideas. We also noted that currently there is no central assembly, auditorium or theatre space. This is again a very different approach to that adopted by western schools – but also many Arabic ones. In practice this means that information is delivered to classrooms through a PA system – and, we feel, there is some loss of the natural internal community building impacts that come from a shared school auditorium and its use as a means to bring the school together. This said, the Gym, which sits at the very top of the building, we feel, has missed a trick in its design. Rather than being designed with one way windows which would have opened onto extraordinary views given the school’s location, instead the design has favoured very small windows which lose any opportunity to leverage the potential of the Gym’s location or the atmosphere that could have come from this. The overall sense of the Gym area in particular, particularly given the limited role, is of quite a remote area, somewhat disjointed from the main school. This said, the Gym sits above a roof top area which will eventually become a botanical garden and quiet shaded outdoor reading area – there is a clear sense here that the vision will take some time to be realised. The school’s Principal, Dr Sheryl Steinberg Abukar, comes across as quite exceptionally caring and driven, with very clear plans for how the school will nurture the gifts of its children. Our sister site, WhichSchoolAdvisor.com, advises us that her approach is very much one based around the individual child, not just in words, but in an exceptionally structured, deeply intelligent, evidence based plan for the school’s future. قيمنـا هـي برنامج عمل سـلوكي يعبـر عنـا كمجتمـع مدرسـي ويعبـر عنـا كأفـراد. Values should be more than inspiring or beautiful words. 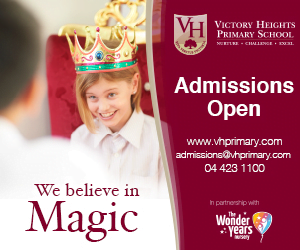 Our values are a behavioural blueprint that shape who we are as a school community and who we are as individuals. In all that we do, we ask ourselves – does this promote what we value most? Excellence in Education – Excellence in Character – Excellence in Faith. As educators, our job is to help all students learn how to use the tools of literacy, inquiry, and critical thinking to discover their unique capabilities and to appreciate those of others. Dr Sheryl Steinberg Abukar. Founding Principal. Next Generation School. 2016. “Unlike most schools, NGS does not expect our diverse learners to adjust to the curriculum; rather Next Generation School’s educational framework will adjust the curriculum to the needs of our students.” WhichSchoolAdvisor.com. Official Q&A. Next Generation School. 2016. Whilst in its early days, there are three features of NGS that we really like, each designed around meeting the needs of the whole child and or individual child need. 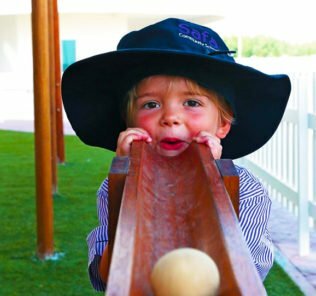 First, the school has created a really thoughtful and inspiring economic engagement programme to build each child’s appreciation of the world outside school from an early age. Practically this has seen a sophisticated but very engaging and child-friendly integration of advertised roles within class and the school that children can apply for. On successfully taking up positions, children earn a monthly salary in NGS currency paid into their own “bank account” and which can be used to pay bills on the use of desks, donate to good causes (the school matches NGS currency to Dirhams for charitable contributions) or save. Currently the scheme is being expanded so that children can start their own businesses, again receiving income in NGS currency. Whilst similar programmes have been developed in other schools, this is by far the most sophisticated we have seen – and we think the school deserves credit for making it so intrinsic to school culture – and at such a young age. We really like this programme. Second, from KG2, electives (which currently include Robotics, Martial Arts and a range of mainstream sports from netball to swimming) are chosen by children, not parents. The aim is that children follow their passions unencumbered by expectation and the aim is eventually that electives will form the basis of each child choosing their own ECA journey as they move through the school. Again, we really like this approach which both to empower children from a young age – and respond to the interests of children outside the core academic disciplines. Third, and as importantly, the school is taking Special Educational Needs and Disability (SEND) provision very seriously. We think how a school responds to its most vulnerable children through SEND provides a very good indicator of how genuine a school is in its commitment to individual children and leaving no child behind. This is very important to prospective and existing parents because all children at some phase of education, in different ways, will almost certainly need individual support. What we have seen on our visit is a school that is doubling its planned investment in SEND provision because of the identified needs of children who have joined the school. This is expensive – but this is a school that is genuinely committed to educating all children effectively without discrimination. There is something undoubtedly very special about Next Generation School. We came away actually thinking that had its approach been a little more balanced, its opportunities would actually have made it a school that would have excited many parents outside its natural Islamic faith school audience. That is a credit to the school. For parents seeking a faith based, Islamic education for their children – but one that draws the faith into academic life rather than separating it, the school presents an extraordinary blueprint for bringing East and West together. Whether it will achieve such a noble and ambitious goal, time will tell. Yes, there are tweaks with design and function which we feel could be made, and a few lost opportunities. And it is not a school, by design, that offers enough of Western touches to appeal to the very broadest international audience. Feedback from parents and teachers in 2018 to both ourselves and our sister site, WhichSchoolAdvisor.com, has been exemplary. As it stands, however, it is the detail, innovation and care invested in children and the education they receive academically and as human beings in that important much broader context of the whole child that makes NGS shine – not its (very good) facilities. Compliments do not come much higher. Recommended.